Zattoo’s legal status is, arguably, a bit of a grey area. While the Internet TV service, which features live streaming of existing over-the-air and cable channels, claims it only does so within the law – either through government legislation or direct licensing agreements – its business model remains a controversial one. And it seems that Hollywood has finally taken notice. Broadband TV news reports that Universal Studios and Warner Brothers are suing Zattoo for the way in which it streams German television channels ARD and ZDF. 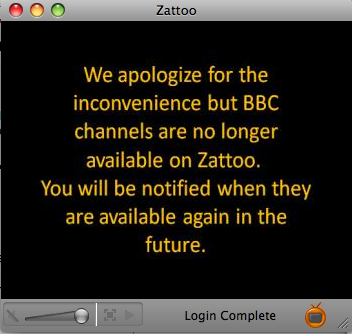 Under a 12 month license, Zattoo is able to carry both channels’ content live an “unabridged”. It’s the latter that the Hollywood studios are taking issue with since Zattoo inserts an advertisement everytime a user switches channel. Whether or not you’re convinced that in the age of on-demand there’s an appetite for live TV over the Internet, two services that deliver just that are claiming impressive growth. “Zattoo is growing nice and steadily”, the company’s UK and Ireland Country Manager, Alexandra Illes, told last100 in an email. “We have reached over 2.4 million [users] and are now available in over eight countries.” Zattoo delivers live streaming of existing ‘over-the-air’ and cable channels, with various channel lineups depending on country. Zattoo (see last100 review), which offers live streaming of existing ‘over-the-air’ and cable television channels, is deceptively disruptive. The technology, peer-to-peer, significantly lowers the cost of delivering Internet TV, while a legal loophole has allowed the service to expand its UK offering, without formal licensing agreements. The company’s business model also occupies a somewhat grey area, whereby an advertisement is displayed for 5 seconds every time a user switches channel, meaning that, technically at least, Zattoo isn’t placing ads inside of third party content.